If you've been over to my Destinations page lately (or ever, really), you'll notice that a couple of continents are woefully blank — Africa and South America most notably so. Even though I've been to more than 35 countries around the world, I have yet to set foot in Africa or South America. Shocking, I know. What am I thinking?! Well, I'm thinking that I just haven't gotten around to those continents — YET. And that's a big yet. I've already written an entire bucket list just for South Africa. And lately I've been thinking about South America. Yes, the 1.7-mile-long series of waterfalls on the border between Argentina and Brazil is definitely on my South American bucket list. I've seen (and been impressed by) Niagara Falls — but Iguazu reportedly puts Niagara to shame. I would love to stand there and be surrounded by gigantic-waterfall mist. 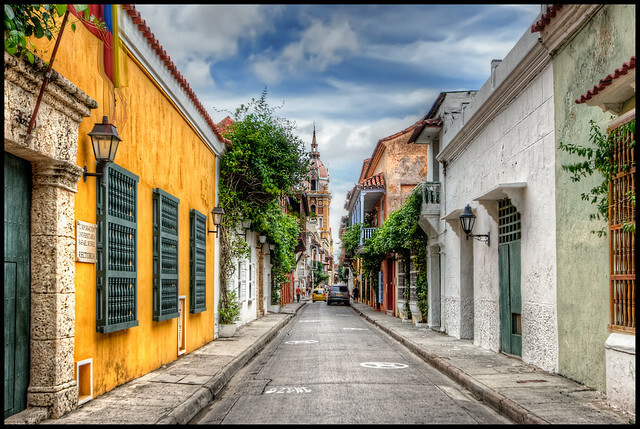 Colombia has long been on my bucket list, and colorful, Caribbean Cartagena is the main destination I'd love to visit. I've seen the photos of colorful streets and the city's colonial walled center and know that it's right up my alley. I can already envision myself and my camera going for many strolls through town. I'm still uncertain if a multi-day trek to Peru's top tourist site is in the cards for me, but I know that I DO definitely want to see Machu Picchu for myself someday — even if I take the train. It's sure to be epic and unforgettable, either way. Hundreds of forced-perspective photos — that's what I want from the world's largest salt flat. 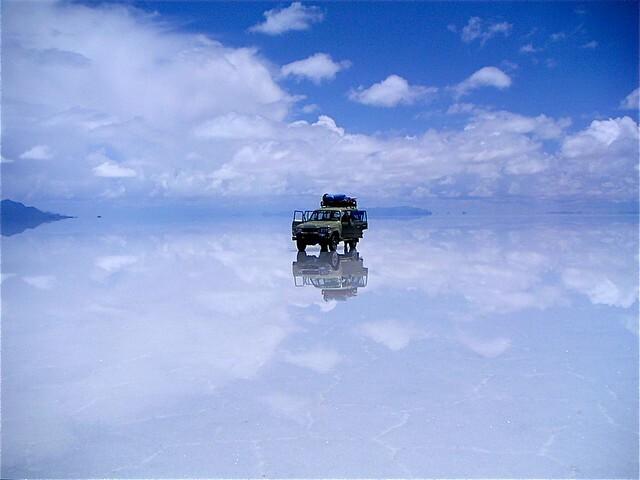 Located roughly in the middle of nowhere in Bolivia, getting to Salar de Uyuni is an adventure in and of itself. But mountains, lakes of flamingos, and those iconic expanses of salt would totally be worth the few days of no wifi or showers that it takes to get there. Located off the coast of Ecuador, the Galapagos Islands are a bucket list destination for a lot of people — and for good reason. It was here that Charles Darwin studied and formed his conclusions about evolution, and also here that you can find some seriously unique creatures. Lazy sea lions, giant tortoises, iguanas, boobies (of the blue-footed, winged variety)… I'd love to island-hop through the archipelago and see as much as possible. For a long time, Rio did not feature on my bucket list. The city seemed to big and unwieldy — I felt like I would just be overwhelmed. But then I saw pictures from the tops of Corcovado Peak and Sugarloaf Mountain, and of Copacabana and Ipanema beaches… and I reminded myself that I've survived in places like Hong Kong and New York and Shanghai. I can totally do Rio — and I hope to someday! 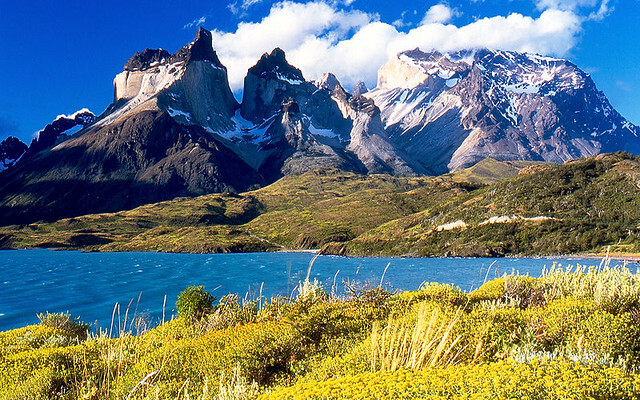 Lastly, even though I'm not a huge trekker/camper, I would love to do some hiking in Patagonia — namely, in Torres del Paine National Park in Chile. Mountains, glaciers, rivers, lakes… the views looks incredible, and I would love to put my camera (and my hiking shoes) through its paces here. What destinations are on YOUR South American must-see list? South America just is the one for me, Colombia in particular (Cartagena is as beautiful as they say). Patagonia is still on the to-do list, as is Easter Island and Colombia-wise I would love to whale-watch in Chocó and finally do the Lost City Trek. All of that sounds awesome – I think Colombia is probably at the top of my list, country-wise! I have never been anywhere in South America before. I would be happy to visit any of these places 🙂 Those waterfalls looks so pretty!! It’s a continent I definitely need to visit someday, too! Don’t forget major altitude sickness for Salar de Uyuni, over 3,656 meters above sea level! But still a dream of mine!!! Yeah, that definitely worries me! But I still really want to go. I had the same impression of Rio – thought it would be too big, too crowded, etc. I hate big cities normally, but I was really surprised when I got there. Yes, it’s big, but it actually feels small and fairly intimate. The areas by the beaches from Copacabana to Leblon are easy to navigate on foot and definitely have that small town feel, with little restaurants, bars, and cafes lining the streets. There are lots of cool neighbourhood markets where you’ll blend in with the locals. And the big attractions are actually pretty quick and easy to get to. I loved Rio!!! Hope you get a chance to visit it soon! That’s all great to hear, Oksana! I went to South America for the first time this summer, and I’m already itching to go back. Iguaçu Falls and Rio were both bucket list items for me, and both were as wonderful as I’d imagined. I was a bit worried about Rio’s sprawl as well, but the subways and buses were surprisingly easy to navigate and when all else failed, taxis were readily available. I’d love to go to Peru next – especially after seeing some of the deals you can find on flights from the US! Yeah, it is quite surprising that you haven’t made it to South America yet! Anyway, the bucket-list sounds exciting! I want to visit Machu Picchu so much… there is too much talk about it. The world is just too big, and there’s too much to see! I’ve never set foot in South America either, and would absolutely love to! Speaking to a fellow traveller on a bus a few days ago, he had recently been in the Galapagos Islands and after three years on the road said it is one of his most favourite places he’s ever been. I’m convinced I need to get there too! Yes, whenever I see photos from there, I know I just HAVE to go! Ah, Salar de Uyuni is definitely on my bucket list too! It looks so amazing, it is probably the number one place I want to go in South America. .. Also, Patagonia sounds really nice! Yup, I would love to see those salt flats (and take all the silly photos!). You nailed the bigguns! I hit up Machu PIcchu and holy sh*t was it memorable. Every snap you posted makes me want to leave immediately and see the rest! I’ll bet it was memorable! I mean, how could it not be?? Even though I spent just over 10 months in South America last year, I actually only visited one of these places – Salar de Uyuni! And “roughly in the middle of nowhere in Bolivia” is exactly correct. It’s also bloody freezing at night, too! I would love to go to Cartagena too, as well as Medellin and Bogota. In fact, just Colombia generally! Yes, Colombia fascinates me – it’s been high on my list for a few years now. Angel Falls and Lake Titicaca are on my list! Torres del Paine is amazing – I think I could spend weeks in Patagonia without getting tired of the beautiful scenery. All the photos I’ve seen of Patagonia make it look incredible! Lake Titicaca would also be cool! Did you do some crazy adventure spots in Banos? I’ve heard great things about Medellin – it’s definitely on my list, too! Of interest, “In Patagonia” by Bruce Chatwin is a classic travelogue of Patagonia. It’s still in print and published by Penguin Classics. Oh, awesome! I’ve read Chatwin before – I really enjoyed “Songlines.” I have have to check his Patagonia book out, too! Rio was a definite highlight of my 4 months in South America, the other highlights were places that I hadn’t heard about before I went. Think I will have to write a blog post about them! Catagena is definitely beautiful but I preferred Minca, Villa de Leyva and Salento in Colombia. Yes, you should definitely write about them, Katie! Great list you have comprised there of top 7. I’ve been to 4 of them and must say they were amazing. Hopefully you get to make it to South America one of my favorite places. I will certainly make it there someday, don’t worry! Which 4 have you been to from this list? I have not set foot in South America either. So much to see. I think at the top of my list for SA is the Atacama desert. I am kind of fixated on it. Ooo, yes, the Atacama looks pretty stunning, too! I’m not much of a trekker, but awesome to hear that you had such a great time! Nice! I’m still not convinced that I could handle hiking the whole Inca Trail… but I suppose you never know! There’s certainly a lot to see down here in Colombia–though Cartagena didn’t exactly capture my heart (bolted out after just two nights). I only planned to travel for a month or two here in Colombia, but I’m still here 10+ months later. Their travel slogan “the biggest danger is wanting to stay” or however it goes, has some truth to it! Hahah. Haha, good to know! It’s definitely quite high up on my travel wish list. Patagonia, Iguazu, the Galapagos, and Machu Picchu (despite how touristy it is) are on my list as well! My dream is to live in South America, but for now we’re “stuck” in Germany. Haha! Germany’s not too bad! 🙂 I really need to travel more in South America!